When words in verse are paired with the awesomeness of nature, something magical happens! Beloved former U.S. 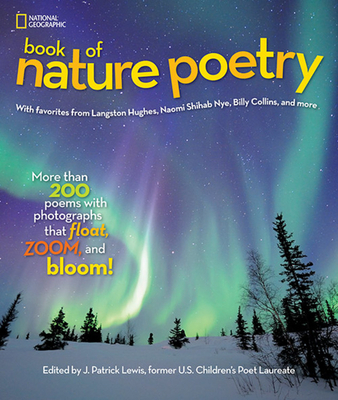 Poet Laureate J. Patrick Lewis curates an exuberant poetic celebration of the natural world in this stellar collection of nature poems. From trickling streams to deafening thrunderstorms to soaring mountains, discover majestic photography perfectly paired with contemporary (such as Billy Collins), classics (such as Robert Frost), and never-before-published works. J. PATRICK LEWIS earned a BA at Saint Joseph's College, an MA at Indiana University, and a PhD in economics at the Ohio State University. Lewis taught in the department of Business, Accounting and Economics at Otterbein College until 1998 when he became a full-time writer. He is the author of more than 50 books of poetry for children including Spot the Plot: A Riddle Book of Book Riddles (2009, illustrated by Lynn Munsinger); New York Times Best Illustrated Book The Last Resort (2002); The Shoe Tree of Chagrin (2001) which won the Society of Children's Book Writers & Illustrators' Golden Kite Award; and A Hippopotamusn't: And Other Animal Poems (1990); and he has collaborated with other poets on several collections. His children's poetry has been widely anthologized, and his contributions to children's literature have been recognized with the 2011 Poetry Award from the National Council of Teachers of English and the Ohioana Awards' 2004 Alice Louise Wood Memorial Prize. His poetry for adults, which includes the collection Gulls Hold Up the Sky: Poems 1983-2010.